Hello Anna, we are delighted to sponsor you, a local female climber who has had a fantastic 2018 – gaining heights in many senses of the word. Let’s begin with the basics, what does climbing mean to you? Thank guys! I’m very grateful for the support. I started climbing when I was ten and, apart from a small break in my teenage years, it has always been my main focus. When I was younger it was always just something I did for fun, and while that’s still the case I guess it is now a bit more than that. It’s kind of a way of life in that most of the things I do in both my free time and work life are centred around climbing. I like that there is so much variety, that there’s always a new challenge around the corner, and it’s a great distraction from any negative things in life. At the beginning of 2019, many people pick up hobbies and try new things, here at Dirtbags we are always looking for adventure and to learn skills along the way. What advice would you give someone who would like to begin the sport? Get some good shoes, learn the basic skills that you need to be safe, and then just have fun with it. What I love about climbing is that it never feels like a particularly serious sport. You can just muck about making up silly boulder problems at your local wall, have loads of fun and still improve. I’d also say to try and climb with people better than yourself, as it is a great way to learn.I never had any formal coaching but just picked up bits and pieces from the good climbers at the wall. It’s funny, the few situations I have been in where a fall would have been genuinely serious I’ve been able to keep my head. I have also lost my cool spectacularly in situations where I probably could’ve fallen off and been fine (unfortunately most of these have been on film). I would partly put that down to inexperience, as I have definitely thrown myself in at the deep end of a few routes and found myself in situations I wasn’t prepared for, but it’s a valuable learning experience for the future. On bold climbs if you’re not climbs if you are not climbing efficiently and moving well you are probably in trouble already, so it comes down to being able to switch off your brain for those crucial moments and know you are climbing perfectly, as any shaking or hesitating will probably make you fall off. It is a skill that I haven’t mastered yet, but I’m slowly getting better at it. How did you find filming ‘Brit Rock’, and what challenges did you face while being part of the Brit Rock team? Getting used to being filmed all the time was a bit strange, as I had limited experience with that sort of thing in the past. However by the end it had started to feel more normal and acting natural in front of a camera was a lot easier. I guess the biggest challenge of the whole thing was just getting an ending to the film. I had a project that in the end was climbed by someone else, but I was actually still intending to finish the film off with that route regardless, as I had put so much time into it. However, literally the day after the route was climbed I snapped a finger pully whilst bouldering, and I suddenly couldn’t climb at all! We had two or three weeks left to finish the film, and it was going to take two or three months for my finger to heal. I honestly thought it was over then, but I got really lucky with Obsession Fatale as it was both a route I already really wanted to do, and was also the only one I had a chance of climbing whilst injured – so we just about got away with it. Where is your favourite place to climb? That’s a tough one! I love to climb in so many places but if I had to pick just one I’d probably go for a place called Reiff on the North-West coast of Scotland. I’ve been on family holidays there since I was little, and it is where I did a lot of my first outdoor climbs, so it is pretty special to me. It is one of the most beautiful areas I have been to; I have had some pretty great evenings bouldering on the cliffs with just a few seals and porpoises for company. To me it doesn’t get much better than that. What lies ahead for you this year, and what are you most excited about? At the moment I’m trying to put in some training time for the coming year. I have always been very guilty of relying on technique when climbing, and my power and endurance suffered, so it has been nice to make progress with those. I think I am most looking forward to just expanding the range of climbing that I do. I travelled around the UK a bit this year, so the plan is to go back fitter and more experienced and hopefully start ticking some routes off. The UK has so much variety within climbing, and I want to experience as much of that as I can. 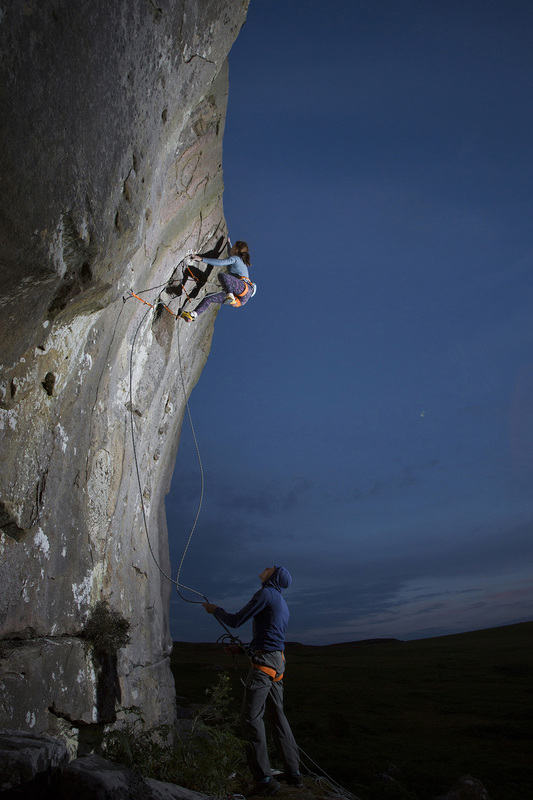 Has climbing outdoors affected the way you see our landscape and the place you live? How would you encourage climbers to look after our environment? Absolutely. I was born in the Lake District and I still live here, I probably took the area for granted when I was younger, as it was all I’d ever known. Now I’m a little more travelled I can see more clearly how special this place is, and spending time on the crags only reinforces that more. It is important for climbers to remember that although they are climbing on a crag, it doesn’t give them any right to alter or damage the landscape around it. I am a massive animal lover so seeing things like cigarette butts, plastic and other potentially harmful things at crags always make me sad, as it show how careless some people can be. It only takes a small amount of common sense to leave a crag how you found it, and this is particularly important in the somewhere like the lakes. Next post: Dirtbag Diary: James – overcoming injury.